2019- 3 of the 10 best wins over the strongest statistical teams in the last couple of decades. I wonder how players on Gonzaga and Kentucky ranked by recruiting service standards vs our Vols. National Coach of the Year, Rick Barnes. I think you’re right. From a money perspective a reasonable goal should be a Sweet 16 every year. Interesting to see how it pans out with Schofield gone, Williams and Bone possibly gone, and now Turner going in for another shoulder surgery. We really need a recruiting uptick to sustain these expectations. I think we can call the Sweet 16 an annual goal, and see if the seeding (Top 4ish) fits as we go. But these eight teams combined still only make the Sweet 16 52.5% of the time, or 58.3% of the time they qualify for the tournament. It should happen more often than not, but as Barnes experienced at Texas, even the best teams are ripe for an upset every so often in the first and second rounds. Calling it a goal should also come with the understanding that it won’t always happen and doesn’t for anyone; only that Duke, Kentucky, UNC, Kansas, Michigan State group, the bluest of bloods, made it at least six times in the last decade. Recruit in the top 25 nationally at least every other year. Minimum top 40. Top 4 in the SEC regular season every year . Win SEC regular season or SECT every fourth year on avg. Make the NCAA tournament every year. Forgive the occasional exceptions due to flukes, injuries, etc but aiming for 70% of the time or better. Celebrate the Elight 8, Final Four and National Championships as one-offs when talent, coaching, injuries, officials and opponents all line up the right way. Awesome Pete. I wish most of our crazies had this attitude. Expecting us to suddenly vault ahead of the Dukes of the world because we’re paying top 3 is not gonna happen. We’re not a bball powerhouse and have never been…we’ve only made the tourney 21 times in 109 years. I think expecting to get out of the first weekend at least every other year is fine and after that, especially with the poor officiating and the way teams play now, there’s as much luck as talent. If Carson Edwards and the other kid are in the slump they were in prior to the tourney, we win going away. The St Mary’s thing last year was also a fluke. We’ve been unlucky to see small, 4 guard, shoot the crap out of the ball, teams that we have trouble defending due to our size and relative lack of quickness. New to this venue and glad see so many more level headed responses to coach Barnes’s disclosure the other day at his presser. For my two cents I am so happy our AD and those others involved used great judgement and help retain a winner. Lets all get behind the program and get ready to rumble!!! Isn’t this the quietest spring practice you can remember? basketball royalty missing: Duke, Carolina, Kansas, Syracuse, etc). We are known as a football school. But the fans who vote with their feet would say we are both. Duke has a pretty good excuse for being missing from that list. Yep, they play in a high school gym. Some of that is fun with numbers. That doesn’t negate your overall point, though. Tennessee has a long history of success in basketball, being either 2nd or 3rd to Kentucky and Alabama in most SEC metrics. The highs haven’t been as high as some other programs, but UT is undoubtedly one of the conference’s most successful teams. The cutoff to make the top 25 bounces between 10k and 13k from 1978-2018. Stokely had capacity of 12,700. Yet, we still managed to make the top 25 for the 10 years until TBA opened. So I don’t know if I’d put as much weight on Kansas’ capacity at 15-16k as you do. We also suffered thru some pretty average basketball while staying on the list, including a 5-22 (93-94) record, which was one of 5 straight losing seasons in the early 90s. Still, we had top 25 in attendance. That’s basketball loyalty. Syracuse is the only one I’ll admit to fun with numbers as the NCAA started with a top 25 in 1978 and Syracuse didn’t invest in the Dome until 1981. They’ve been in the top 5 generally since then. But let’s really be honest – there’s not much to do in upstate New York in the winter. Those guys are just trying to stay warm in the winter and the Carrier Dome is heated. Carolina only averaged 15.8k in year 1 of the Dean Dome but they probably would have made it if they’d been willing to step up and invest in facilities earlier. They deserve a knock for not doing so during some pretty impressive Dean Smith years (including the 1981-82 National Championship). Duke’s attendance stadium choice is self-inflicted. Could they have made it? Yes, if they’d invested in something larger than a Texas high school gym. But only 4 made it every time. Speaking as a current Duke student, I’m not sure how well Duke would do at filling a 20,000 seat arena, consistently, honestly. They have a big national fanbase, but it’s quite geographically dispersed. They’re probably third place locally behind UNC and NC State. It’s a small undergraduate student population too. Outstanding piece and you nailed it. Tennessee has now made the financial commitment to be a non-blue blood elite basketball program. If the Vols can’t be in it, I will cheer for Bruce Pearl. This run over New Mexico State, Kansas, North Carolina and Kentucky makes me feel a little better about being blown out in the SECT championship game. I rationalized it with “Kentucky took all we had in the semis”. Besides, Go Auburn sounds a lot better than cheering for Calipari. I still think this when I see Cal: Get Your Used Cars at Calipari’s Car Lot where “we don’t care about your credit; we care about you!”. I am glad he is not our coach anymore and I will happily root against him every time his team plays. Auburn is the perfect place for him and his attitude about rules. Your comment about rules is ironic because Bruce Pearl and Auburn lost the game when the official failed to properly apply a rule in the last 1.5 seconds of the game. No Double Dribble apparently is equally effective as Lying About A Cookout in keeping Bruce Pearl from coaching in a championship. It’s a credit to what Rick Barnes and these players have built that, in the immediate aftermath of Purdue’s win, I could google 2020 NCAA Tournament sites with a straight face. Well written as always Will! It will be very interesting to see how the offseason plays out. I believe at least one of Bone/Williams returns. I agree that the inside players stepping up will be key. Walker has shown flashes (see last year’s South Carolina game in Columbia), but he needs to defend at a higher level and be more consistent. 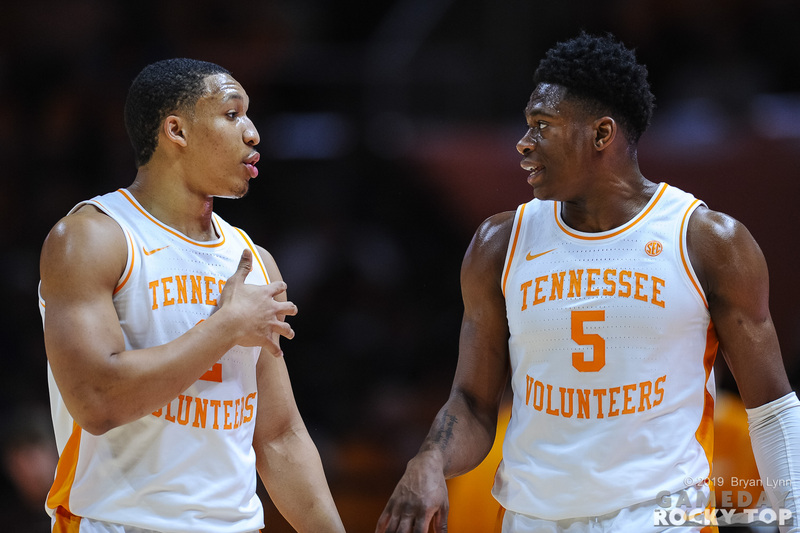 We all know what Fulky can do, but it will be interesting to see if DJ Burns can lose weight and be an effective inside scorer, an area where Alexander was not consistent. In addition, I’ve heard that Zach Kent can play the “stretch” 4 position with the ability to knock down 3-pointers. Maybe he becomes a factor. I think another consistent inside scorer could have pushed this team to the Final 4, but too often, Alexander would get in foul trouble or disappear, leaving teams to double or triple Grant Williams. I’m also wondering about attempting to replace Schofield’s offense. 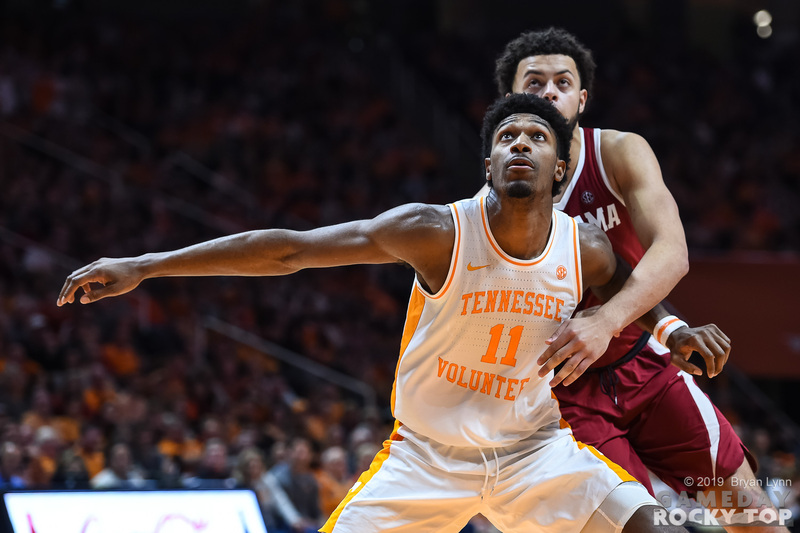 He is a once-in-a-generation player in terms of leadership and that will be impossible to replace, but I believe if Jalen Johnson improves enough defensively for Coach Barnes to trust him to more playing time, and Josiah James is the real deal, they will be able to at least mostly replace his scoring. Throw in Yves Pons, who I still think has more offensive potential than he has shown, then it wouldn’t be a stretch to see those 3 players coming with 15-17 points/game to offset the loss of Schofield. As you stated, Grant will harder to replace than Jordan Bone, given his leadership and so much of the offense running through him. I feel like he’s the type of kid who enjoys college (aka Joshua Dobbs) and hope he will stay to make one more run at the Final Four. Even if Bone and Williams both leave, we should still have enough pieces to get 20+ wins and be a solid seed for the NCAAs! Thanks again for all of your great reporting! Well, the headline of this piece took on a whole new meaning last night. Sounds like we’re getting our first real test of Philip Fulmer, Athletic Director. Let’s hope he is up to the task. Great write-up, Will – a fitting end to a great season. Love this team. 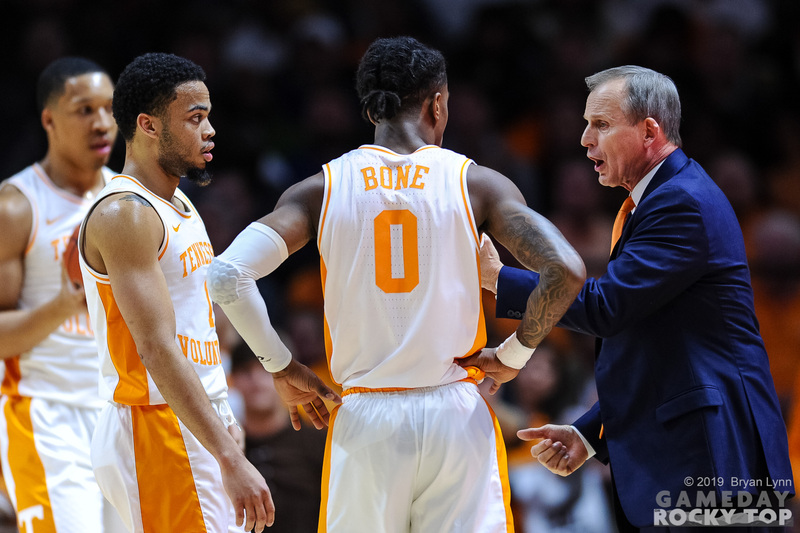 This Tennessee team talks a lot about the 2017 off-season as the launching point for their success. It first showed up on the floor against Purdue. I’m not sure this is good news, but if we have a 15+ point lead on anyone left in the tournament I’d be surprised. Not sure there are any leads left to blow for anyone in this thing now. I don’t like our “stall” offense. I’m all for slowing things down when you have a lead, but the way we go about it seems wrong. We should still be trying to get a good shot and score. But when we have gotten big leads lately, Lamonte or Jordan will dribble the clock down to 6 or 7 seconds and then has to rush a (usually) ill-advised shot. Barnes had a quote ahead of Thursday’s game about making mistakes earlier in his coaching career by changing things up in terms of routine, etc. ahead of tournaments. He implied that he had learned you’ve got to maintain what got you there. In that way, I put a lot of what happened yesterday on him. Yes, players play and there were some really sloppy plays, but it was clear they’d talked at halftime about taking the air out of the ball to shorten the game instead of continuing to operate how they had in getting the lead. Let’s not do that anymore! Good point, though the way we played in the first half Sunday I think we could get up big on anyone. I think at this point, it’s safe to say that this team peaked 6-7 weeks ago. On KenPom, the efficiency margin hit a max of +29.06 on 1/30/19 after the first South Carolina game, basically tied for 5th; the margin is now 26.38 and the Vols are 10th. The defense had already been trending down by then, falling from 92.3 after the first Florida game to 93.7 to now 95.9. The offense has been fairly steady, but the pace they play has ground down from 69.4 to 67.6. All of that fits into a narrative where it can FEEL like they’re not playing very well. On the one hand, they’ve led by a combined score of 91-58 at halftime in the first two rounds. On the other, they’ve been outscored 83-57 and caused inordinate amounts of stress to themselves and their fans. And because of that, I can totally understand people being…dissatisfied?…with the first weekend and HOW we’ve made the Sweet 16. Two months ago, we were harboring legit national title aspirations, and now we halfheartedly worked our way past the 35th and 124th ranked teams. But then you have to remember…this is only the 8th Sweet 16 this program has ever made. There’s really no point in being upset about that, especially since everything we thought was possible 2 months ago is still possible. Such is the nature of tournament basketball, where the only thing that matters is surviving to play another game. Auburn is getting a lot of press for their 10-game winning streak and blasting Kansas…but they’re any number of possibilities in the last 3 seconds against New Mexico State (dude goes for the layup instead of passing the ball out, dude hits 3 FTs instead of 1, dude hits the shot at the buzzer) from having crashed out already. There are no bad wins in March or April. I hope there are several more to come. Yes, I would have been disappointed by a loss on Sunday, but everything from this point on is gravy. I think we belong in the top 8 teams int he country but I think Purdue has a claim to that as well. May the better team win. Survive and advance. I kept going back to thinking as Iowa rallied that if it went wrong, this team would have no representation in the rafters. I was hopeful we wouldn’t run into one of these coin flip games until the Elite Eight, but Purdue definitely qualifies. Hard to argue that their level of basketball peaked in that mid-tier SEC stretch, but also something to be said for playing 10 straight tournament foes and going 7-3 in that run. I think if they lose in the second round, it will go on a list with 2001 LSU and, more recently, the second half of the 2016 football season. And people can say what they want about us hanging a Sweet 16 banner, but if they don’t make it there, this team won’t have any representation in the rafters at TBA, which would be really strange. 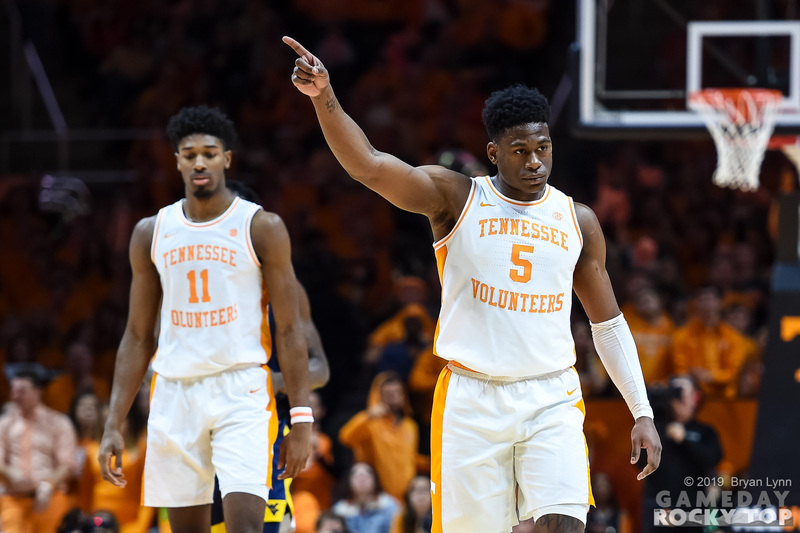 Hit the nail on the head with this analysis… Colgate’s ability to hit the 3’s is worrisome to me if our Vols get lazy and take these guys lightly. Tighten up the defense, play with energy and like every one of these games could be your last and send you home. Go Vols! AMEN… a very difficult game to watch. Go Vols! I made the drive from Memphis to see this one. The atmosphere outside and inside the arena in the lead up to the game was GREAT. It was 90% the right shade of orange, and it was LOUD. And even after getting blitzed for 30 minutes, when the Vols cut it to 15, it got LOUD again. The fans desperately wanted it. I certainly knew going in a loss was possible; a letdown is only natural after the emotional outburst of the game on Saturday. But getting blasted was not really something I considered. It was disappointing, but you’ve got to tip your hat to Auburn. They created havoc and hit shots. The range of outcomes in the tournament feels exceptionally wide. Yes, we haven’t lost to anyone outside of the top 20 in KenPom all year, but after Colgate, that’s almost exclusively what we’ll see (Cincy is 32, but the potential home court advantage may bump them up). And to an extent, doesn’t it feel like that outcome will determine how we remember this group? Being #1 for a month, winning 19 straight, 2 wins over UK, those are all special things. But if they lose in the round of 32? Won’t it all feel a bit empty? In the ride either to or from Nashville, my friend and I discussed this: it feels like the O/U on games to win to make the season truly memorable is 2.5. Is that fair given that the school has only made one Elite 8 ever? Maybe not. But this team has done things we’ve never seen before, so I think it’s ok to raise the bar for what success looks like. I got home in time to see the last 1:47. All i can say is WOW. And i thoroughly enjoyed the interview after. This team has been so much fun to watch for the last two years. GBO. Keep it goin’ and GBO! Fantastic article, Will! Very well written. Well… just “wowza…” coming out of my seat all the way to end. It was like a heavyweight boxing match trading blows back and forth when the challenger comes off the ropes with a flurry of punches for the knockout! Let’s whip those Tigers and cement an early and big lead to coast home for the championship. Don’t ever leave you man and follow them all the way to mid-court if necessary to defend the 3. Go Vols!! I have always thought the best UT-KY game I ever saw was the 1975 game (TN won 103-98), but that was a regular season game. This was a tournament setting, down by eight with under three minutes left, and this team found a way to win. This might have been better. It belongs in a museum.